as Next Month and in as Little as 3 Hours! It is for these reasons most doctors just pass up this incredible marketing opportunity altogether OR for those that do attempt a PAD, their effort consists of simply putting snacks out for patients to graze on as a well-meaning but poor attempt at thanking them for their patronage. THE RESULT on both accounts is that they’ve made no real ‘positive impression’ on existing patients or grown their practice in any way. The way you Think About and Setup a Patient Appreciation Day is all About to Change! My name is Dr. Daron Stegall and along with business consultant Dr. 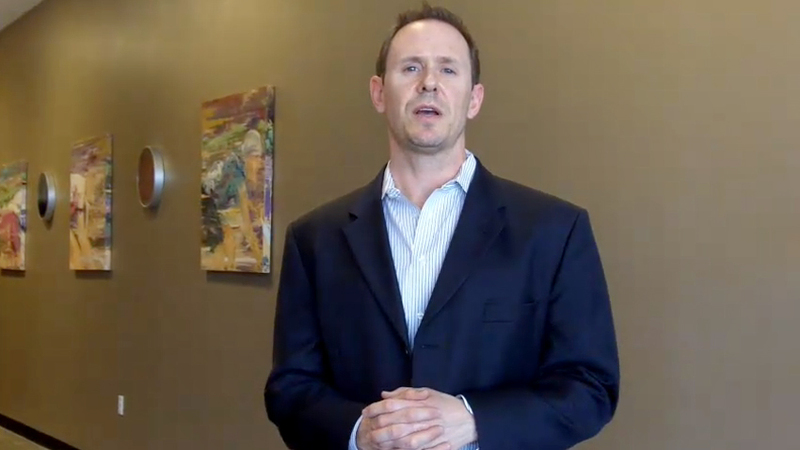 Troy Counselman, we have written chiropractic books including Ultra Success in the Business of Chiropractic and created the longest standing free chiropractic marketing and business blog (www.successfulchiro.com). We have also created some of the most innovative and successful practice building strategies in our profession which we compile as part of our flagship chiropractic business success program called Patients to Profits. And, right now is your opportunity to grab one of our most creative and fun to implement practice growth marketing strategies ---- and get it at a fraction of the retail cost. And yes I did say ‘FUN’ to implement. Fun is definitely not a word often associated with marketing your practice. Typically words such as ‘Expensive’ and ‘Time Consuming’ are a little more fitting. However The Practice Building Patient Appreciation Day is something you and your staff will actually enjoy doing. …BUT you can get 10, 20, 30 or even 40 new patients from the event within just a few hours! – THE FRIENDS AND FAMILY OF YOUR EXISTING PATIENTS! And while your patients have friends and family they talk to about you all the time, the stumbling block is those people actually picking up the phone and scheduling an appointment. Through the power of The Practice Building PAD you give your patients and their guests a completely different opportunity to meet you face to face and get a quick spinal assessment in a friendly commitment-free environment. Whether you currently see 50 or 500 patient visits a week, it’s imperative that you are always taking steps towards improving business income stability by ensuring your active patients stay while also injecting new income into your practice by getting new patients through the door. This is that is what a Patient Appreciation Day done the right way will help you accomplish. Don’t take the chance of doing another PAD that yields little more than money spent on food and an occasional ‘thank you’ from your patients. You now have the opportunity to learn this from someone who has successfully set up over 50 PADs in his own clinics and shown hundreds of other doctors how to do the same. This concise and easy to follow video training series walks you through a systematized process for planning and executing this powerhouse marketing event. And it’s all delivered to you in short easy to digest videos that you can watch between patients and get knocked out in one day – OR better yet, assign a staff person to watch and plan the event for you. Discover the Setup Secrets that will ensure existing patients and their guests are blown away – and it isn’t the free food that does it! A blueprint of all the marketing options that fit the smallest to larger budgets – All geared to get you the biggest turnout possible! Not only does this program include everything you need to easily get a profit generating PAD planned and set up, but it also includes all needed marketing materials. There’s no sense in you sitting around trying to figure out how to create the marketing materials so we did it for you. And as a BONUS, I have had all videos converted into a transcript professionally edited and complete with the video slides. This makes setting up your PAD event easier and quicker than ever. As a SECOND BONUS… I have included a MAP (Marketing Action Plan) for the PAD program. I know you’re busy so I don’t like to take any chance that you have to try and reinvent the wheel or guess on any of this. The short 3 page MAP will ensure that doesn’t happen. So… What’s the Price Tag? 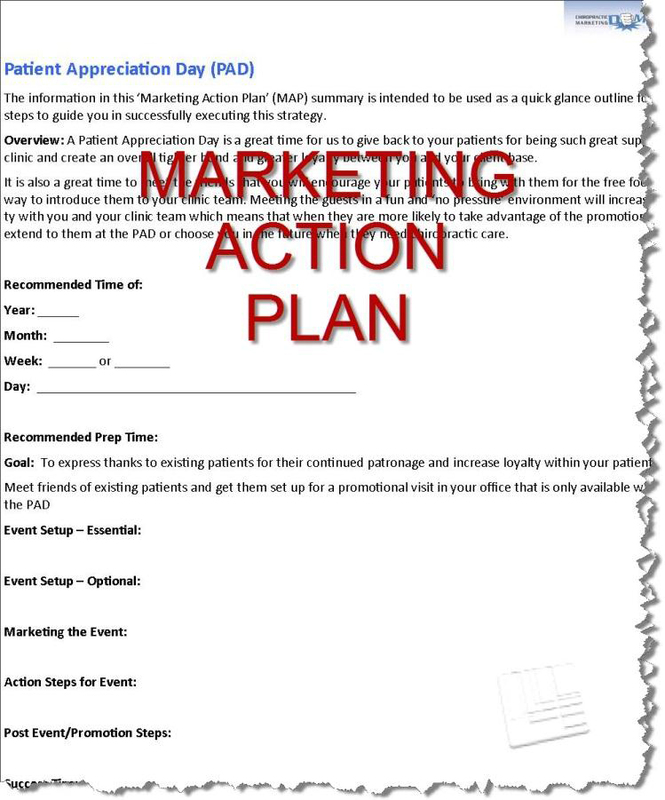 There’s no doubt this marketing event will be one of your most successful practice growing campaigns you will do and the best part is whenever you’re ready to have a Patient Appreciation Day event, just reopen this step by step guide, quickly review it and get er’ done! And considering the number of new patients this event can yield and the fact you can use it year after year $199.00 would be a steal. Simply click the big ‘Add to Cart’ button below and in just a few short minutes you will gain instant access to the exclusive membership area and the entire Patient Appreciation Day event protocol and bonuses. By clicking above you will be transferred to a secure online order form and to the exclusive membership site for immediate access. It’s all here, everything you need to get a Patient Appreciation Day event set up with none of the guess work involved. And you have instant access to it at our exclusive membership site for almost 70% off during this early-bird special release. Remember this is a time tested marketing event that I created by doing it year after year in my own clinics (both in clinic and at offsite locations) and have instructed hundreds of doctors on how to do the same. And don’t forget about the special bonus Marketing Action Plan that is a 3 page cheat sheet that takes you step by step through the entire planning and execution of a successful and stress-free PAD. And we are so confident it will work for your practice we let you give it a try for 30 days with a no questions asked money-back guarantee. We really do make it that easy for you! DISCLAIMER: This is a limited time new product release offer instantly accessible via digital format only – there is no physical product [The physical product is part of the full Patients to Profits program which sells for $1997 and can be found at patientstoprofits.com]. Click the ‘Add to Cart’ button above to see if the $67 early-bird special pricing is still available.